Redshirt freshman punter Joe Doyle, who’s having a stellar season for the Vols, gets an inspirational message from his grandfather every Friday night before Tennessee games. The letters come like clockwork every Friday night. Before he nods off to sleep, Joe Doyle checks his email to read words of inspiration from his 85-year-old grandfather. Jack Belcher has been writing Doyle letters since high school. But once Doyle became the starting punter for the University of Tennessee football team this season, Belcher made sure to send one every week. The former pastor tells his grandson how proud he is, how grateful he is to watch him play and always includes some scripture to comfort him. Doyle has been a consistent bright spot for the Vols this season. The redshirt freshman has punted 35 times, averaging 41.7 yards per punt. He booted a career-long 71-yard punt against Georgia, and has had 15 punts downed inside the 20-yard line. Doyle will try to help Tennessee (3-4, 1-3 SEC) win the field position battle on Saturday night at South Carolina (3-3, 2-3). The Vols are hoping to bounce back from a 58-21 loss to No. 1 Alabama and keep their bowl hopes alive. Doyle is the hometown kid who grew up dreaming about playing for UT. 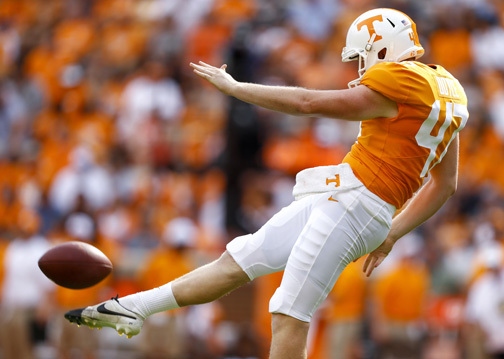 An All-American kicker at Farragut High, he was eager to join the legacy of great UT punters that have worn orange and white. Doyle had scholarship offers from several smaller schools, but his heart was set on playing for the Vols. The youngest of six, Doyle grew up idolizing his older brothers, Aaron and Andrew, who played college soccer. Aaron was also an All-American punter at Farragut in 2004, and Joe would constantly watch replays of his games on VHS tapes. Joe began kicking in middle school and attended kicking camps across the country in high school to gain exposure and experience. 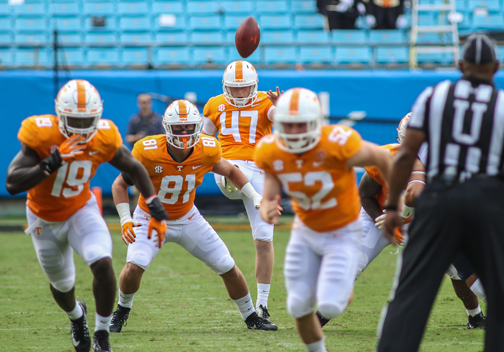 Although he was heavily recruited for a punter, Doyle’s family knew going anywhere but Tennessee wasn’t an option if the Vols expressed any interest. “He wanted to play for Tennessee probably since the eighth grade. He’s been a Vols fan for life. He grew up in a family of Vols fans. He was going to UT no matter what,” Doyle’s mother, Lisa, explains. Since Doyle signed as a preferred walk-on, the Vols have recruited other punters. The coaching staff made it clear Doyle would be in constant competition to secure the starting job. Doyle still shares a close relationship with his older brothers. After years of idolizing them, they are now his biggest fans and follow his every move. “I try not to bother him as much as I really want to,” Aaron Doyle adds with a laugh. “I really do want to contact him almost every day to ask for an update and ask how practice went. But I don’t want to annoy him. Doyle waited patiently behind Trevor Daniel last season, absorbing as much knowledge as he could from UT’s career leader in punting average. The two worked out together this summer after Daniel signed as a free agent with the Houston Texans. Daniel has since joined the rich tradition of UT punters turned NFL starters, a list that includes Knoxville natives Dustin and Britton Colquitt and Michael Palardy. Doyle’s older brothers played against the Colquitts in high school soccer. The local fan base has showered Doyle with support this season. Along with a large contingent of family in the stands, Doyle has tons of friends from Farragut that have watched him play his entire life. Doyle’s grandfather, who played football while he was stationed in England in the 1950s, hasn’t missed a single punt by his grandson this season. Every Sunday for 50 years, Belcher wrote an article in the church bulletin. Being able to write letters to his grandson every Friday this fall is something he doesn’t take for granted. Doyle calls his grandfather each week to thank him for writing and tell him how much better he feels after reading his letters. It’s a tradition Belcher plans to continue for as long as Doyle keeps playing football and as long as the good Lord is willing.